From the Blogger: "Baskets are excellent for storage and organization. This tutorial shows how to make your own fabric baskets, which is perfect because you can choose your own fabrics that coordinate with your home decor. No need to settle for something that doesn't exactly match. This tutorial shows step-by-step with pictures how you can use canvas, interfacing, and cotton webbing to make your very own fabric baskets with handles in very little time and for not too much money." 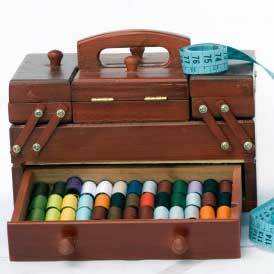 Oh my word, I can think of at least two hundred uses for this gorgeous and EASY storage bag. And that is just for my craft studio. The childrens rooms could do with a whole bunch too so thank you for this great pattern! It is really easy to follow. I have already made the first one and am busy cutting the fabric for the next. Soon we will have the most organized home in the world, lol! So many uses for this basket! I could make two or three for my granddaughter to put her toys in when she comes to visit. I could use one in my sewing room. I could use one to carry things in and out of our RV. It would be easy to modify the pattern to make different size baskets as well. Love this! Organizers like this really help clear up the clutter in my sewing room. Thanks for the idea!